Hacksaw’s have a very wide usage in the manufacturing industry. Hacksaw’s are used for fast and efficient cutting of metal, wooden, plastic rods and pipes as per desired dimensions. Well manually operating a hacksaw is a quite strenuous and tiring process. 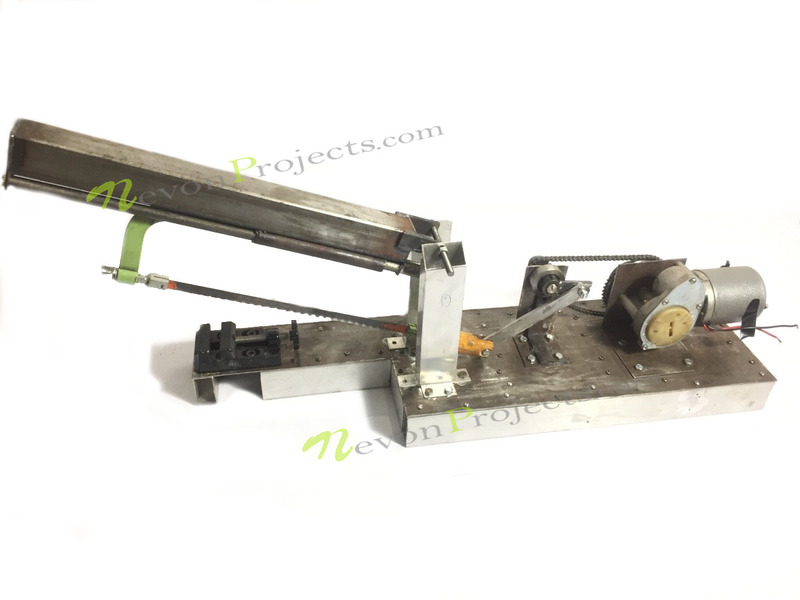 So here we propose a fully automated motorized hacksaw that has the capability to automatically operate the cutting mechanism without any manual interference once set in process. The system uses a motor to drive the hacksaw shaft which is connected to a connecting rod. The connecting rod is now screwed to the cutting frame in such a way so as to achieve the desired back and fourth motion from the motor. The cutting frame is designed in a way to easily attach the saw blade to it. Now we use a chain sprocket arrangement in order to transfer the motor strength to the shaft. The other end of machine holds a holder that is used to hold the cutting part in place, so as to achieve desired cutting results. We use a high torque motor in order to achieve this cutting motion since the cutting process delivers a lot of resistance. We then build a supporting metal frame to support and hold the entire machine together. Thus our system provides a fully automated motorized hacksaw that works on chain mechanism.